For her latest collection, ’Biophilia,’ the Icelandic original has reinvented the album into a transformative transmedia experience of music, animation and apps. It’s a sad irony : The digitization of music has impoverished the average listening experience. Not only do compressed files sound meager compared to the sonic prowess of good old vinyl, but buy an album on iTunes and you also don’t even get production credits, let alone booklets full of strange photos and imponderable lyrics. Björk’s seventh album hits stores Tuesday as not just a collection of MP3s or a compact disc. The best way to experience "Biophilia" is to download it as a free iPad, iTouch or iPhone app, then purchase apps for the individual tunes. In this way, you not only get an animated version of evanescent songs with nature-oriented names such as "Solstice" and "Virus" but you also get a game that allows players to manipulate musical elements, a vocal-less score for esoteric karaoke nights, an essay explaining the history and meaning of each tune and, yes, lyrics. These are liner notes to the nth degree. But in conversation and in song, Björk inevitably reveals herself as a deep-thinking, hard-working original who’s always looking for the next challenge — an emotion-driven polymath constantly seeking new tools and outlets for creative expression. The woman’s a Björkaholic. "Funnily enough, my intention in the beginning was to simplify stuff," she says of the sprawling project dubbed "Biophilia." "It’s sort of like a weird spring cleaning. You go in the attic and tidy up the attic, and before you know it you paint the house and have done all the rooms." To call "Biophilia" an album is really a misnomer : It’s a quintessential example of a work of transmedia, an academic and industry buzz word for creations that tell their stories across multiple platforms. There’s the audio version of "Biophilia" and the multimedia app. It is also an educational workshop, museum installation and performance series. "Biophilia" began as a science film with Björk’s longtime video maker, Michel Gondry ("Eternal Sunshine of the Spotless Mind"). When that iteration ran into roadblocks, Björk started developing the songs as not just sonic recordings but also as visualized compositions. The touch-screen instrument she had been using in concerts enabled her to completely change her songwriting process. "I probably write most of my melodies walking outside. I’ve been doing that since I was a child," says the former singer for the Icelandic new wave group the Sugarcubes, who recorded her first album at age 11. "My accompaniment has always been nature in a funny way.... So this is the first time I have really written like this, and for me it was exciting, and it helped me get out of stagnated methods." The globe-trotting explorer whose previous recordings had been inspired by Spanish beaches, New York bridges and of course Iceland’s landscape of ice and volcanoes now had a virtual world at her fingertips. "With a touch screen, you’re more self-sufficient. You have a library of landscapes, locations." Björk used cyberspace to explore inner and outer space. Each song on "Biophilia" tackles a different scientific subject. The music is appropriately experimental and atmospheric. "Crystalline" cracks to life with drum and bass break beats ; "Cosmogony" rolls psychedelically. On some songs, Björk used an algorithm to create the bass line. The singer has been seriously geeking out. "I didn’t want them to get stuck inside that virtual reality," she said. "I want them to have some sort of exit route into the real world of oxygen and hair and wood." 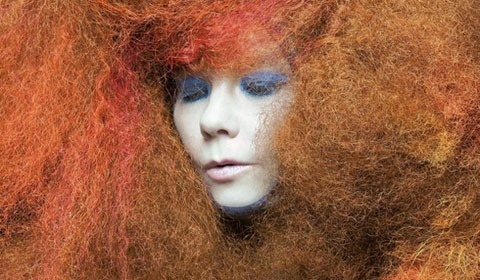 Björk premiered "Biophilia" at the Manchester International Festival in England in June. She conducted workshops for students that mixed scientific explorations with musicology. Then she performed the tracks live, supported by her pendulums and a women’s choir. "I’ve always been attracted to new formats, because the iron is still hot and you can mold it," Björk says. "It’s an opportunity to go by impulse or intuition or poetic license."